Odinn has a tubular hem. I have never done anything like this, I have done some tubular cast on and bind off, but never understood the idea until now. This sweater is a great opportunity to make this technique second nature. I left that needle in place as a lifeline until I was done with the tubular bind off. I wanted to be sure I did not have to rip it off lol. 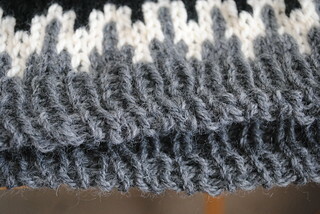 The tubular bind off is a modified kitchener grafting of a 1 x 1 ribbing. Your Purl stitches on one needle and your Knit stitches on another. Thanks for Techknitting.com for the quick explanation of the technique. I was talking about you the other day and I had a reason to visit you today. What a great blog to visit and read so much good help. The edge of this sweater looks very nice. I know that I will have to have a lot more practice than just one sweater. I am now confident I can do a toe - up sock without the fear of what the bind off will look like. I like this tubular bind - off a lot. It is definitely very stretchy, stretchy enough for a sock ribbing. Thanks for stopping by!